“It has never been more important to restate the importance of play. 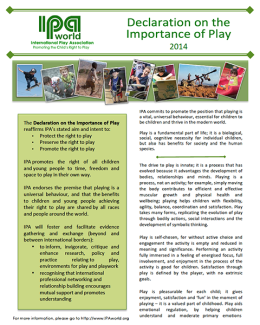 Fundamental, essential, vital – the words in this Declaration reflect IPA members’ message to the world that play is an essential part of childhood. All children have a right to experience play which, in the words of the Declaration, is free, open, boundless, sometimes chaotic, sometimes transformative. Play is a right which all adults have a responsibility to uphold.